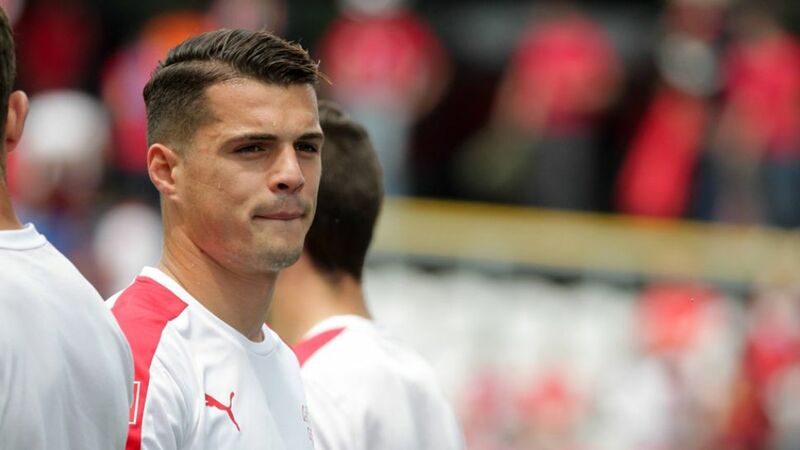 Saturday was an emotional day for Granit Xhaka, who lined up for Switzerland against Albania, and his brother Taulant. "Fortunately, it's over," said Granit Xhaka after what was likely one of the most difficult games of his career. Switzerland edged Albania 1-0 in Lens to sit at the top of Group A alongside France, who beat Romania in the opening game. Xhaka, though, was not only relieved after a hard-fought match was brought to a successful close. For the former Borussia Mönchengladbach captain, who recently swapped the Foals for Arsenal FC, Albania versus Switzerland represented a battle between his heritage and his home, and, even more poignantly, a contest against his elder brother Taulant. The Swiss took the bragging rights on the day, holding their nerve to see out victory after TSG 1899 Hoffenheim's Fabian Schär had headed them into a fifth-minute lead. Although Albania captain Lorik Cana had been sent off after 37 minutes, Switzerland were unable to open up a bigger gap on their opponents, with Eintracht Frankfurt striker Haris Seferovic failing to capitalise on three separate chances. "Perhaps Haris was saving his goals for the upcoming matches," joked Swiss midfield fulcrum Xhaka at full-time. Gladbach goalkeeper Yann Sommer also impressed, pulling off a fine save to deny Shkelzen Gashi two minutes from time. "Yann has shown, both in the Bundesliga and in Europe, that he is an exceptional goalkeeper and he is in excellent shape," enthused Switzerland coach Vladimir Petkovic. Xhaka was equally effusive: "Today, we were lucky to have Yann Sommer in goal. He was the man of the match." Sommer may have got Xhaka's vote, but it was the midfielder who was rewarded with the official Man of the Match honour. The 23-year-old completed 129 passes in Lens, becoming only the third player to exceed the 125-pass threshold at a European Championship after FC Bayern München's Xabi Alonso and former Italy star Andrea Pirlo. There was no ego to go with Xhaka's achievement either. Asked by a member of the British press if the high transfer fee paid by Arsenal to Gladbach was a burden, Xhaka coolly replied: "Whether the fee was one million or many millions, the price does not affect me." At the end of the 90 minutes, Xhaka was nonetheless visibly drained. He had been battling with flu for two days in the run-up to the Albania match, and had even missed training. His desire to play in such a special game was strong, though, and he left an indelible mark at the Stade Bollaert-Delelis. Far from being satiated, Xhaka wants more. "If we win on Wednesday against Romania, then we are through," he said. "Then it's the last game against France for first place in the group." Eli, the mother of the Xhaka brothers, was in the stands for the game wearing a t-shirt showing both the Swiss cross and the double-headed eagle of Albania. In her chest, two hearts were beating on Saturday. Granit completed 90 minutes, with Taulant coming off just past the hour. "We conducted ourselves professionally, we went into our 50-50s at full-throttle and nobody can accuse us of shirking our duties," said Granit. "Now I am happy - a bit happier than Taulant." The match was not a loaded encounter for the Xhaka brothers alone. Across both squads, 13 players would have been eligible to represent their opponents on Saturday. Albanians are one of the largest immigrant groups in Switzerland, and seven of the Albania squad have represented Switzerland at youth level. "The pressure was high," concluded Granit, who raced off into the changing rooms at full-time to be embraced by both sets of players.